This teaching program takes a fun concept and makes it into a grammar teaching tool. 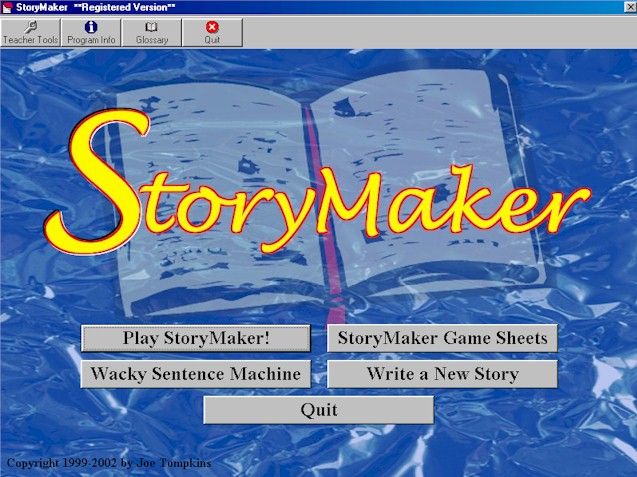 Teachers create the 'story' using StoryMaker's simple interface, leaving the blanks for students. Then, students get on the computer and follow the directions ('Give me an Adjective', 'Give me A Noun', etc...) StoryMaker takes their words and fills them into the story... with often hilarious results. Since you write the story, you decide what blanks the story will have. Have your students not covered adverbs yet? No problem. Just add the blanks to a story. Are you studying proper nouns this week? Great! Add lots of them to your story for kids to fill in. Add your students names to the stories to really get their attention. There are no limits to the possibilities. Never before has grammar been so much fun.